Explanation: The North Pole of Mars is ringed by a "sea of sand dunes". For Mars' Northern Hemisphere, Spring began in mid July and increased sunlight is now shrinking the polar cap revealing the wind-swept dunes to the cameras onboard the Mars Global Surveyor spacecraft. North is up in this recently released close-up which covers a region about 1.2 miles across at 77 degrees Northern Martian Latitude. 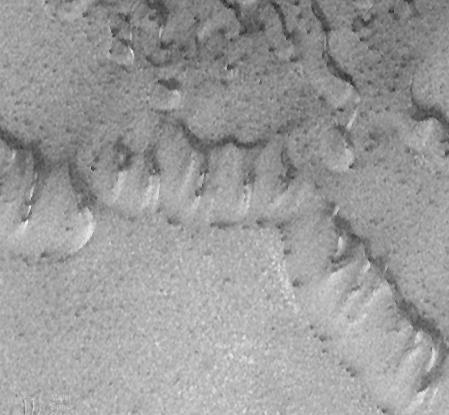 These dunes have been formed by winds generally blowing from the Southwest and are still covered with scattered white patches of carbon dioxide frost. Near the end of January 1999 Summer will begin and offer even clearer views of Northern dunes of Mars.